Every geek in the world knows about the fabulous Consumer Electronics Show - CES - held every year in Las Vegas. For weeks before the event, the techie news is full of what hot technologies and devices are going to be displayed, what up-and-coming companies are going to be in attendance, which famous tech leaders are going to be speaking, what the big-name tech firms are bringing. And during the show and for weeks afterward, the techie news is full of live-blogs of the show, the gadgets, the "best-in-show", and running commentary about when the devices are going to hit the market and what the future holds for the direction of the tech trends. I'm sure it is the dream of most geeks to attend CES at least once in their lives; that is the way it is for me. Therefore, I was quite pleased when my boss told me that the company team was going to CES and invited me - even though I had already told him I was going to soon resign to pursue the Raytheon opportunity. As it turned out, we arranged for me to stay on as a part-time contract employee, so it was still as an honest-to-goodness Marcus Engineering employee that I was able to see CES 2019 from the inside. As it turns out, it was necessary for me to come as a ME employee. I had always thought about going to CES, but it's in Las Vegas for a week, and I could never justify the time-off. However, not just anyone can attend - only "Industry Members" and "Media" can buy admission, and part of the registration is verification of your claims to be an "Industry Member". Thinking about it now, however, I've had more than a few people telling me that I should set up as a private contractor with a Limited Liability Corporation (LLC), which is fairly cheap and easy to do. I would imagine that I could qualify for CES registration as a private contractor. All the same, I got to go with Marcus Engineering - and I probably won't be going back (see below). Patrick Marcus - Owner and President of Marcus Engineering. Mark Omo - Patrick's right-hand man and a stellar electronics and software engineer, both professionally and as a hobbyist. Kempton Hall - The only full-time employee and a super technician - he can build anything. We arrived at McCarran Airport after an hour-and-a-half flight on Southwest. I was a bit surprised when I stepped into the airport, because I had been here making connections before, en-route to Salt Lake City and Calgary. What I remember from before (late night layovers, trying to get some shut-eye between flights) was the darn slot machines throughout the terminal with their flashing lights and incessang ding-ding-ding-ding-ding. There was none of that. It's possible that the ding-ding-ding style of slot machines have been completely replaced with the video-game style that don't make the annoying racket, or it could be that American Airlines uses a different terminal that still has the annoying ding-ding-ding style. In any event, we got through the airport to the Rideshare pickup and soon all four of us were stuffed into a smallish car to go to the hotel we were booked at, to register for our rooms early and drop off our luggage. After a quick bite at the complimentary breakfast at the hotel (Red Roof Inn on Paradise Road) to supplement the breakfast burritos that the boss very kindly supplied to us at the Tucson airport gate, we walked down Paradise to Harmon and over to the Alexis Park hotel, where we catch the shuttle to the Las Vegas Convention Center (LVCC). CES occupies the entirety of the convention center and two complexes of hotels on the Strip. There are a number of complementary shuttle routes to move attendees between the sites and hotels in the vicinity. There's also the monorail - I had thought this might be the best way to get back and forth, but it isn't free like the shuttle buses, even if CES attenders get a (modest) discount. Most of the big stuff is at the convention center. Tech West and Tech South have some particular emphases; the innovation/startup area is at Tech West, which is a major reason for us coming. There's nothing of interest to us at Tech South, so we never go there. I am warned about Westgate (formerly the Hilton) - "miles of USB chargers" - and so I never go there. Not that it matters that much, since we are here for the last two days of the show, and there's going to be plenty to see in those two days. At the convention center, we pick up our badges. The badges are just card stock with punch-outs for the lanyard clips, and the printer is misprinting them such that the punch-outs don't align when the badge is folded as designed. I just live with mine, but Kempton wants a reprint. They take his otherwise-fine badge, and then have to call in to Central to authorize a reprint. We are standing there for at least 20 minutes. Meanwhile, for whatever reason, Mark had neglected to pre-register, so he and Patrick go off to the registration tent. Finally, Kempton's badge is ready, and he and I board the shuttle to Tech West. The shuttle is supposed to go south on Las Vegas Boulevard and turn left to the Sands. There appears to be construction on Sands Avenue and a cop is making a traffic citation, so between the eastbound traffic and the people turning right from northbound Las Vegas Boulevard, left turn traffic is completely stalled. We watch two... three... four traffic light cycles without a left turn signal. Apparently, the traffic signal equipment knows when it isn't safe to allow left turns, and it isn't even turning on the green arrow. We watch a couple of near-misses as impatient drivers turn across in the face of oncoming traffic. Finally, after two more missed cycles, we finally get the arrow and the bus pulls around and stops in front of the Sands convention arena. Kempton goes off the the exhibit halls, and I go upstairs to the Palazzo meeting rooms for some panels. CES is like most other conventions (like computer shows or comic cons) in having speaking events. In looking at the schedule, it is clear that most of the interesting presentations have happened earlier in the week; however, there are two toy-related discussions that I am interested in. I get into the cavernous ballroom and find a seat while the previous panel is winding down - the CEO of World Wrestling Entertainment (WWE) is explaining how they are marketing their product to children. But it doesn't wrap up until long after their slot is over, and therefore both of my panels are cut short. Not well managed. But then, I don't know why they are scheduling panels for 30 minutes rather than a proper 50. Parent STEM anxiety transfers to children. If the parents are nervous about science or mathematics, very likely their children will exhibit similar anxiety, which can affect their school performance. Ambivalence or promotion of both physical toys and screen simulation. Some mention of AR (Augmented Reality) and VR (Virtual Reality). T&K sees the hands-on part as indispensable. However, there seems to be no recognition/acknowledgement of danger of excessive screen time for young children. STEAM versus critical thinking. I am thinking to myself that children really need to develop critical thinking skills as much or more than STEAM application, but the panelists seemed to have been focused largely on the future "careers" of the children in their target market. Does the "A" really belong in STEAM? T&K believe that the "A" (Art) dilutes the STEM (Science) part. Besides, there's already art in engineering. However, the LEGO exec believes that the "A" reduces the STEM anxiety threshold. Coding is part of literature in the 21st Century. To which, I agree, but the cooding should not displace real children's literature, especially classical worldview-forming literature. Toys for preschoolers are hackable by older children. This point was made by the Kano CEO, a young fellow who gave off the unmistakeable impression of being very pro-open source/open hardware. I wanted to ask: Is open hardware or proprietary more common in STEAM toy providers? I suspect most companies won't be so willing to share the technical details of their products. When the morning panels are done (and even though I have more on my list, I never manage to get back; just too much else to do), I descend from the fourth level of the Palazzo and step into the upper Sands exhibit hall, and get my first taste of the scale of CES. It's BIG. And there are a LOT of people looking at stuff and showing off stuff. The purpose of the show is apparently to make industrial deals and partnerships. That is of course why we are here. But I am a bit surprised that there is nothing for sale. At computer shows and comic conventions, the exhibitors are there to sell stuff. Not here. The best I can do (as a hobbyist) is take promo literature and cards and payola (and occasionally samples) for subsequent follow-up. There is actually... NOT much new or innovative. I was especially looking for something new-ish in home automation, but pretty much ALL of it was devices connected via Wi-Fi to the "Cloud". In other words, Internet of Things (IoT). After the twentieth booth of the same stuff, I kind of tune out. There are a LOT of Chinese exhibitors. And of course, that limits what I can do, both in my primary role of looking for business contacts (we can't really partner with foreign interests, especially Red Chinese) and as a hobbyist. All the same, I do see some interesting things. I find the Kano site, and play a bit with their other toys - and find out that no, I can't purchase a Harry Potter hackable wand toy at the show (but they are already sold at Walmart and Target). A fingernail printer. Stick your finger in the hole, and the machine can color-print nail-polish in whatever pattern you wish - including photos. "Mirrors" (actually LCD displays and cameras) which not only show you your face but additional information such as weather or news. Or show you what you would look like with different hair colors. Yeah, real useful. A handheld ultrasonic imager that connects to your cellphone. Energizer (the pink bunny battery company, and yes, they had a person in the pink bunny suit) has a line of Wi-Fi connected home automation gadgets. I thought it odd that a battery company would be into that sort of thing, but heck, everyone else there was. I later discover that the product line, Energizer Connect, has no real internet presence and very limited selection available (Amazon, mostly). Lots and lots of robots - that don't seem to actually do much. This one is notable in having an animated Manga cartoon face. It seems the same observations hold in the Sands lower hall where the "innovation" emphasis is placed. Not really much actual innovation (just lots of warmed-over application of existing tech) and a lot of foreign firms. Not entirely Chinese; there is a large section of French companies, smaller Belgian and Dutch areas, a bit of United Kingdom and Ireland, even Israel. But mostly Chinese. Very disappointing for our business intentions. We all arrange to meet up back at the convention center and visit our Breadware friends in the South Pavilion. The convention center has a North Hall, a Center Lobby, a Center Hall, a South Hall, and outside in the parking lot, in a huge tent structure (which is very similar to what will be set up for the Tucson Gem and Mineral Show starting this week), is the South Pavilion. I notice a truck trailer outside the Pavilion set up as a display or exhibit offering people an opportunity to face their unconscious biases - a taste of the current run-away political correctness right here at CES. Breadware is a little company (larger than ours) that helps other companies with technology solutions. One of these emerging companies is Wayzn, which is designing a gadget to open a sliding glass door to allow a pet to go out or come in. We helped them with some concepts. Shown here is the prototype device or mechanical mock-up. Breadware was the only domestic company exhibiting in South Pavilion. The rest of the vast tent hall was full of smallish booths occupied by orientals - some Taiwanese, some Korean, a few Thai, but overwhelmingly Red Chinese. We looked around a bit and picked up some literature (especially for light manufacturing or flex circuit board fabrication), but it was again nearly all the same - how many makers of USB battery banks and illuminated audio speakers and cellphone cases can actually compete? We rest at a snack area for a little bit, and are joined by Patrick's friend Dr. Matt, who works at Mitre and Patrick is trying to convince him to switch to Raytheon in Tucson. Matt likes Tucson, but he is a pacifist and objects to working on weapon systems. He is also a vegan, and while he and his Mitre friend Christi hang out with us frequently during the next few days, we quiz him about what dishes in restaurants meet his vegan criteria. Then we all get up and move back to the Central Lobby area to catch the Engadget "Best of Show" awards - which I thought would have been in a largish meeting area with chairs to sit in, but it is a disappointing affair just out in the hall at the Engadget booth. We can hardly hear what they are saying over the high-volume music coming from the adjacent Samsung site. Mark is a Las Vegas native, or Henderson native, more precisely (Henderson is a community just southeast of Las Vegas), and recommends his favorite sushi place for dinner. We formulate a strategy of getting on any old shuttle to get away from the crowded convention center to a place where an Uber driver can pick us up. The shuttle that gets picked takes us to Mandalay Bay. Then, in researching Uber options, it is discovered that there are no high-capacity Uber rides that can get to Mandalay Bay in a reasonable amount of time! Since it is already a bit on the late side, we simply proceed into Mandalay Bay and find a suitable restaurant. With astronomical prices for the entrees! So dinner is "tapas": we just order happy-hour appetizer plates. It is a satisfactory dinner. One of the dishes is deep-fried calamari (squid) with a tasty sauce. Kempton learns a bit later, after relishing the sauce, that it is made from squid ink. The day starts with a breakfast burrito at Roberto's at the corner of Paradise and Harmon. It's on the way to the Alexis Park. Next door to Roberto's is Med Men, a marijuana dispensary. Nevada is yet another state that has legalized recreational use of marijuana. We can see through the restaurant window into the Med Men place, and it looks like a buffet. I tell Patrick about my daughter's experience of getting her annual employee drug test in Colorado, another legalized-marijuana state, and ask him if he had considered what he would do about a drug test as part of hiring should Arizona legalize marijuana (which in all likelihood it will). He says he hasn't really considered it, and hasn't run across any reliable literature about permament deleterious effects of marijuana. As we leave Roberto's and continue on our journey to Alexis Park, a worker at Med Men opens the door and invites us in. Nevada is a weird state. There's very little to the state other than Las Vegas, Reno/Lake Tahoe, and a lot of empty Federal-owned land used for military testing. Gambling is legal state-wide. Prostitution is legal (but regulated) in many of the counties - but not Clark County in which Las Vegas is located. Of course, illegal doesn't mean nonexistent, and there's obviously a lot of prostitute action is Las Vegas. Now marijuana is legal. I wonder if they will discover what Colorado has, that making it legal does not reduce the illegal; underground marijuana produced and distributed to avoid regulation and taxation will be (if not already is) much more than what is visible. I wonder if the social and economic costs of legalized marijuana will ever be acknowledged or measured, or how much Nevada will continue to embrace vice. Today is the last day of CES, and we start by looking around the large exhibits at the convention center. One thing we have already noticed is that Google is a significant sponsor of CES. Many of the people staffing the vendor sites and booths are wearing Google coveralls ("are they employed by the vendor, or are they Google employees? "), and there's lots of young people walking around in Google coveralls and caps. Outside the Central Lobby is a giant Google promotional gumball machine dispensing plastic spheres containing Google-made gadgets - and there is a two-hour line for the machine! LG is showing off their OLED video displays. They have set up a sizeable room with curved OLED screens showing large synchronized video art. It really is a beautiful and mesmerizing effect. Just beyond this room, LG is showing off their new OLED television, a large-screen display that retracts into a box sitting on the floor. There are several such screens that are deploying and retracting at different times but all showing the same synchronized video images. Bell Helicopter is showing off their concept Air Taxi. Very similar to their Bell V-22 Osprey that takes off and lands vertically and transitions to forward flight. I hope they have better luck with their Air Taxi than the V-22 which has had a very rough history (crashes, dead Marines, etc.). It seems that Boeing is also developing an Air Taxi, although theirs seems to lack the safety shrouds around the rotors. Mark thinks these will never actually be put into service considering all the FAA and other regulatory hurdles, but I think he's wrong; major aerospace companies like Bell and Boeing aren't doing this for laughs. Many of the big-name auto companies are here with huge elaborate displays. Certainly what has attracted me to the CES idea are these large bombastic exhibits. In reality, the car companies all pretty much have the same stuff - all-electric cars and autonomous (self-driving) cars, and a few autonomous variants: city public transit conveyances. Honda is here, but not really showing off their cars. Some off-road vehicles, autonomous off-road vehicles, and this robot concept, which is designed to navigate through crowds of people. Of course, there's going to be pop culture at the Consumer Electronics Show. "Minions" are bigger than "Hello Kitty", but this makes me think of Faith. Victrola?? But the original Victrola was a big wind-up machine with an acoustic pick-up. These are snazzy retro LP record players. There was a lot of retro at this show. I hadn't seen record player Hi-Fi consoles outside of antique shops, but there were a few on display at the show! Polaroid Land Cameras! Like I said, not much really innovative, but instant-print cameras? Talk about throwback! There was a line of people waiting to get their instant photo taken. We speculated briefly whether it was actually a miniature photo-quality ink-jet printer or actually the same self-developing photo process as originally, until we noticed some of the people walking away from the site holding their photos by the corner as the image slowly developed - just exactly like 40 years ago! Panasonic also has a line of good-looking but smallish 3D printers, as well as a hand-held 3D printer pen (dispenses fast-setting plastic resin allowing you to build thin/fragile models and artwork). Here is a tribute booth for the Radio Corporation of America - one of the original American electronics companies. It doesn't exist as such anymore, as the parts of the RCA empire were spun off to different new owners, but this was a wonderful mini-museum of what RCA was and did. Note "Nipper" the "His Master's Voice" dog. An antique RCA television set. I'm guessing my dad may have had something like this in his home at some point. Or maybe not; Oklahoma farmers may not have had enough free money to get pricey consumer goods. What I missed was any mention of RCA's venture into the computer world with the CDP1802 - the first all-static CMOS microprocessor. I may still have one or two of these in my junkbox. Really has a fascinating instruction set. It was also the basis of RCA's consumer computer system, the COSMAC Elf. It was already obsolete and off the market by the time I started eyeing the TI-99/4A, but original and reproduction COSMAC systems are still available. In fact, while the CDP1802 (and probably the semiconductor part of RCA) went through several hands - Harris Semiconductor, followed by Intersil - Renesas holds it now, and they actually list the CDP1802 as an active part. Furthermore, Mouser lists it for sale, but they have no stock. I think the fully-static 1802 is also available in a radiation-hardened version which is still of interest for aerospace applications - I know the Amateur Satellite (AMSAT) people incorporated it into their system that launched in the '90s. RCA gave us a lot of things, such as the ubiquitous "RCA" connector for audio and low-bandwidth (RS170) video. Before leaving Central Hall, we stopped at the Nikon site. Half the people at CES were carrying yellow Nikon payola bags. Patrick is really a Canon guy, and I prefer Olympus, but we sit listening to a lecture by professional photographer Charmi Pena and pick up some great tips about lighting. In South Hall, there were (in addition to many other technologies) lots of drone companies. Big drones. Little drones. Underwater drones (in fact, I don't really like using the term "drone" to what are actually "Remotely Piloted Vehicles" (RPV) - an underwater "drone" is otherwise known as a "Remotely Operated Vehicle" - ROV). Little drones with bright multi-color LED lamps that fly in synchronized swarms to make airborne light shows or advertisements. Semi-autonomous drones (which are getting closer to an actual "drone" - a "drone" is an autonomous vehicle, especially an air vehicle - a "drone" is really supposed to be a flying robot). Even a hoverbike "drone". I'm inclined to agree with Mark on this one - this is cute, but it will never become a product. Related to drones was robots. In particular, industrial robots, most dramatically demonstrated by Omron. In their site was an elaborate table tennis-playing robot called "Forpheus". There was a line of people waiting to match their ping-pong skills with Forpheus. It wasn't humanoid, of course (industrial robots are not), and the control electronics were displayed behind a plexiglas plate. Patrick and I speculated about how many motor control channels we could see through the plexiglas. There were other lines of attendees outside of booths. I mentioned the Polaroid and Omrom queues. The US Postal Service (? Consumer Electronics?) has a site at CES, and Patrick recommended a look as they previously had cool payola and game prizes. Didn't see any of that (yet another disappointment), but there is a line of people at a kiosk to send an electronic postcard from CES. Also in South Hall was video game technology. Lots and lots of "gaming keyboards". How many companies making illuminated high-tactile keyboards can actually compete? And yes - all Chinese companies. A furniture maker had obtained a license to the Atari name and made these interesting Pong coffee tables. They aren't video-based! The paddles are mechanically moved by the knobs, and the square "Pong" ball is a physical object moved apparently by magnetic means by a mechanical arrangement underneath the play field. Again, that was an in-person photo using my not-so-good-in-dark-places camera. Here is a stock photo. After spending most of the day looking at the big exhibits at the convention center, some of us return to the "innovation" area at the Sands lower convention hall for one more try for some business-useful contacts. We turn up empty. Patrick and some of the other fellows had been to previous CES shows and were encouraged with successful contacts, but they tell me that the quality of the show for this purpose seems to have been declining over the past few years. They also confirm the increasing proportion of Chinese and other foreign vendors which are not useful to us. In the end, we all agree that this is probably the last CES that Marcus Engineering will attend. I am glad I got to go and see it this time, and I'm not particularly sad that I'm probably not going to see it again. We board the shuttle back to Alexis Park. A couple carrying large illuminated speakers are on the bus with us. It seems that as vendors tear down their booths, they will often sell their booth stock to fortunate bystanders to avoid having to drag it back home - or even give it away. I've seen something like this at the Tucson Festival of Books. I was not so fortunate - or maybe I was, since there's no way I would have been able to put many CES product samples in my carry-on luggage. Tonight, we make good on Mark's sushi recommendation. From our hotel, we get an Uber ride to "I Love Sushi" in Henderson. There's a line out the door - apparently Mark was on the money about it being a good place. While we wait for a table, Dr. Matt and Christi show up as invited, and we resume the discussion of whether sushi or cow's milk or bee honey or squid-ink sauce is allowable for vegans. Soon we are seated in a spacious booth looking at the sushi explanations. Lots of silly names, some of them obscene. Each of us pick two types, and Matt orders his Tempura Vegetable meal. As the plates start coming out, we find that they are indeed delicious, and we ordered way too much. When the meal ends, I am in some discomfort, and we still take two carry-out boxes back. Which get put in the room that Patrick and I share, since he bought them (as he did for nearly everything) with the company credit card. Last night, I had researched what there was to do in Las Vegas. Of course, there's actually a great deal to do here, including firing a machine gun on a shooting range, but the constraints are (1) reasonable cost and (2) reasonable distance from the Strip. I suggest the Mob Museum (downtown) or the Atomic Testing Museum (a half-hour walk northeast of the hotel). Mark the native endorses either of these, and Patrick says he would prefer the Mob Museum. So that's where we go to start the morning - after breakfast. Mark and Kempton do not want to finish last night's sushi as this morning's breakfast... so Patrick and I do. Surprisingly, the little refrigerator in the room works too well, and some of the sushi is a little frozen. It still tastes... almost as good as it did last night, and we finish... most of it. I am a little concerned that this sushi will do bad things to me later on today. Fortunately, it does not. Yet another Uber ride (the driver recommends we NOT walk north or east of downtown into the sketchy areas), and we are at the former Clark County Courthouse and Post Office. The lobby has all the brass-door mail boxes used when this was a post office. Patrick buys our tickets, and we spend the next few hours looking at everything from top to bottom. 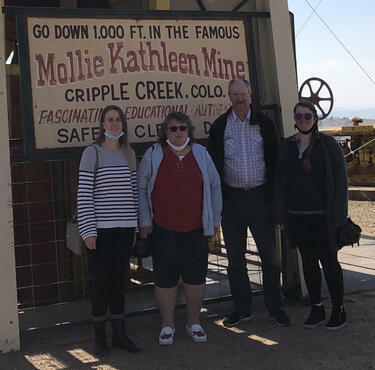 The museum started with the historical background of Las Vegas, which basically started as a drinking and gambling and prostitution center for the miners that flocked to the silver mines of the area. The most significant establishment of the late nineteenth and early twentieth century was the Arizona Club. Criminal entities appeared in the United States after ethnic groups started immigrating - particularly Italian but also Irish and even Jewish groups. The gangs preyed on each other until Charles "Lucky" Luciano pulled strings to get them to cooperate as an organized structure - the "Commission". There was no effective opposition to organized crime at first - even J. Edgar Hoover denied the existence of the Mafia. Eventually, and especially after the Kefauver Hearings (initiated by Estes Kefauver, senator from Tennessee, which were nationally televised and took testimony in various places, including this very building), public opinion grew to drive and support official FBI and local police activity. It wasn't until racketeering laws were passed that the rapid decline of professional criminal organizations commenced. Even so, organized crime influenced politics in the U.S. Havana, Cuba, was an "open" (not controlled by any one criminal group) city, and the nightclubs and casinos were attractions to wealthy American's until the communist overthrow of Batista - the mob was instrumental in many of the anti-communist actions taken by the government at that time. This was the era of Jimmy Hoffa, and the active influence of organized crime in the JFK election. Who knows, maybe the mob was behind the Kennedy assassination and the subsequent elimination of Lee Harvey Oswald. There is very little present-day activity by the criminal groups of the past in the U.S.; however, there's still plenty of organized crime, now driven largely by Chinese groups, the Russian Mafia, Mexican drug cartels, and motorcycle gangs. Come to think of it just now, I don't remember mention of urban ethnic gangs like the Bloods and the Crips and MS-13. I'll note that Kempton wasn't as interested in the organized crime museum as the rest of us, so toward the end, he left to see the Neon Museum on his own. I would have liked to have seen some of the historic casino signs, but I decide to finish this museum. Kempton walked to the Neon Museum a few blocks north (into the area we were advised not to walk). The Mob Museum in Las Vegas has obtained the actual wall from the Chicago garage where the Saint Valentine's Day Massacre occurred, part of the battle of control of Prohibition-era liquor distribution by Al Capone's gang. The actual wall, and actual bullets dug out of the wall - and the dead bodies of gangsters. The day's adventure continues with a walk down Fremont Street in the daytime. One of the things we see is the famous Heart Attack Grill. It is briefly considered as a lunch destination, but we suspect the quantities of greasy food would not be conducive to our enjoying the rest of the day. So we continue down East Fremont Street (into the area we were advised not to walk) in search of the Thai restaurant Patrick has identified. Unfortunately, the Thai place has closed for lunch because of some sort of roof or electrical damage. So we go across the street to a fancy hamburger place (which fortunately has a vegetarian option for Matt, who joins us midway through lunch). Outside the window is the El Cortez, which is the oldest casino/hotel in Las Vegas. A few years ago when we visited Las Vegas, we stayed at the Golden Nugget, which I thought was one of the oldest, and maybe it is, but not as old as the Golden Gate, and not as old as the El Cortez. What to do with the afternoon? Patrick wants to go hiking. So does Matt. I'm up for that. Mark and Kempton don't want to hike, so they are going back to the hotel to rest (and to work on their project for an electronics competition), but he gives us some recommendations. The first is the Red Rock Canyon park, but it turns out that there is no cellphone service there, so while we could Uber out to the park, we could not Uber back. The second suggestion is a trail Mark knows in Henderson which starts in a residential area that should have cellphone service. We choose the latter, and soon the Uber driver has deposited us at the trailhead on a hillside above a suburban housing development. Turns out this is the Amargosa Trail, and follows the maintenance road under the power lines. It is about three miles in to the top of a tall hill from which we can get a view of the area unobstructed by the power lines. To the far right, just on the edge, is the Stratosphere tower, at the north end of the Strip which is visible in its entirety. To the left are some tall snow-capped mountains. Here are my fellow hikers, with the volcanic cinder landscape we have been hiking through. Dr. Matt is lining up his shot of the same photo I've just taken (I'm sure his will be better), and Patrick is checking his cellphone. There is indeed cellphone service back at the trailhead, and soon we are in an Uber ride back to Fremont Street. The driver gives us some dinner recommendations, including the Thai place and the fancy hamburger place and a ramen place near both of them. We check; the Thai place is closed for dinner, and there is a ladder to the roof and men up there with extension cables. So around the corner we go to the ramen place, which is really quite good. Across the same street is the El Cortez, lit up for a Las Vegas night. Further down the street is a new development - the Container Park, an assembly of steel shipping containers repurposed for dining, retail, and entertainment. A view of the interior. Three levels; that's pretty amazing. These are well-established shops and bars. At the back of the park is a stage and a fake-grass area; there is a guitarist warming up on the stage, and some children rolling around in the fake grass while their parents chill. Even the playground equipment is made of steel containers, which I find is interesting after I encounter a sign saying "Warning - Surface may be hot - Do not touch". When Las Vegas hits 100+ in the summer, I wonder if the city has liability for scorched kiddie hands. I knew about Tucson's Mercado San Agustin Annex (MSA), which also consists of repurposed shipping containers. I thought that was an interesting idea at the time. The MSA Annex is just one level. I have since learned that there is a shipping container project on Fourth Avenue that is two levels. We timed our departure from the Container Park to get back to Fremont Street in time for the Fremont Street Experience. We show up under the lights just after it started. This is of course a stock photo of what we saw, since my camera would never be up to the job. The Experience is definitely one of Las Vegas' premier attractions. The end of today's adventure is seeing the Penn and Teller show at the Rio, courtesy of the company morale budget. We actually get pretty good seats, considering the house is nearly full and Patrick didn't make the reservations until sitting at the ramen restaurant just a few hours ago. It was very enjoyable. The best part was the contrast between the big garrulous Penn and the diminutive silent Teller. Some of the tricks are the same I've seen Tucson's own Michael Howell do. Our last day in Las Vegas starts with a buffet breakfast at the Luxor. We are at the Luxor because Patrick and Mark want to experience eSports - a video game tournament. After breakfast, we all check out the eSports arena - which is a room with lots of positions with high-performance (liquid cooled) computers and a stage with a huge screen and about ten more computer positions for the finalists. Of course, this early in the day, there is no tournament, so it is really a chance for Patrick and Mark to play a first-person shooter game. At the entrance to the arena is the Throne of Games. I guess this is the photo-op for the tournament winner. But Kempton and I don't want to experience eSports; instead, we go upstairs and see the Bodies exhibit. I'm somewhat mixed. I understand the controversy, that this is an unspeakable violation of the dignity of the human body, but at the same time, it is an amazing portrayal of the glories of God's exquisite creation (all the "evolution" in the exhibit notwithstanding). Of course, it is unmistakeable that most of these bodies are the remains of Chinese people. At the end of the tour, there is a staffer in a lab smock letting visitors handle preserved organs (I play with a brain). I ask the question about the source of the cadavers, and he explained that China is more open-minded about such things than other countries, and assures us that the cadavers were volunteers. Sorry, I think to myself, "volunteer" in Red China doesn't mean what the rest of us think as "volunteer". Having seen one of the articles being the plasticized and cutaway remains of a pregnant woman and her plasticized fetus, I don't know how anyone could believe this was a "volunteer" in any sense other than the Red Chinese sense. When we're done with Bodies, we go back down and watch Patrick being killed for the last few times. It is now time for our last adventure of our trip. Kempton is getting into the Escape Room business as a prop designer and construction consultant, and he's been in enough escape rooms to know what to do. He convinces the rest of us to try one. Patrick is okay with this, as long as we pick a good one and not the cheesy sort to be found back home. We arrive at the choice - Escapology. We sign in and are inducted into the room and have the rules explained to us. This game is to solve the puzzle to shut down the online theft of a billion dollars by a genius criminal hacker. There is a series of combination locks to containers containing more clues, clues to figure out the combinations, an ultraviolet (black light) flashlight to discover yet other clues, and fake checks with bank numbers to enter into the computer in the hidden room to defeat the hacker. We finish the game in 34 minutes, which puts us at number 80. When we emerge, we find that Matt arrived just a little bit after we went in. The Escapology staff are apologetic about Matt not getting in on our paid game, so they give us a free game. In the second room, we are trying to escape from a ship having been shanghaied and locked into the cabin while the ship is in port. Similarly, clues for combination locks on containers holding more clues and keys for key locks and a black-light flashlight for tracking down the final clue. We finish the game in 38 minutes which puts us... more than 100 down on the list. Well, it was fun, but I don't know that I'm now a huge escape room fan, though. The quality was quite good, as was the steampunk theme in the waiting room. I suspect there is a fair bit of capitalization, and I subsequently find that Escapology is a broad-based multi-site company. After each game, the staff takes a comemorative photo. From left to right is Mark, Kempton, me, Patrick, and Matt. At this point, we have done all we have time and opportunity to do in Las Vegas. Fetching our bags that we left in the hotel office, we get Ubered back to the airport and hang out for a couple of leisurely hours before our 8pm flight back to Tucson. I really enjoyed our company-paid Las Vegas morale trip and the experience of the Consumer Electronics Show - even if I never go back.